Crater Lake partly fills one of the most spectacular calderas of the world, an 8-by-10-km basin more than 1 km deep formed by collapse of the volcano known as Mount Mazama (fig. 1) during a rapid series of explosive eruptions about 7,700 years ago. Having a maximum depth of 594 m, Crater Lake is the deepest lake in the United States. Crater Lake National Park, dedicated in 1902, encompasses 645 km2 of pristine forested and alpine terrain, including the lake itself, virtually all of Mount Mazama, and most of the area of the geologic map. The geology of the area was first described in detail by Diller and Patton (1902) and later by Williams (1942), whose vivid account led to international recognition of Crater Lake as the classic collapse caldera. Because of excellent preservation and access, Mount Mazama, Crater Lake caldera, and the deposits formed by the climactic eruption constitute a natural laboratory for study of volcanic and magmatic processes. For example, the climactic ejecta are renowned among volcanologists as evidence for systematic compositional zonation within a subterranean magma chamber. Mount Mazama’s climactic eruption also is important as the source of the widespread Mazama ash, a useful Holocene stratigraphic marker throughout the Pacific Northwest, adjacent Canada, and offshore. 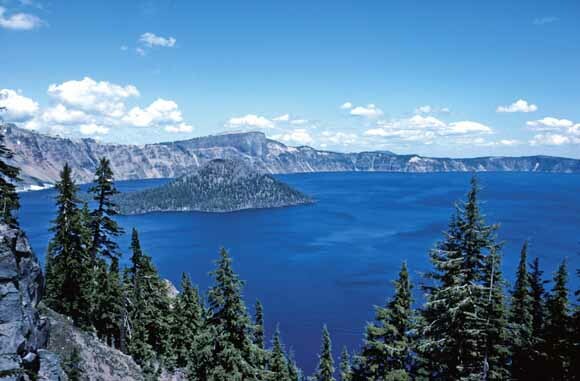 A detailed bathymetric survey of the floor of Crater Lake in 2000 (Bacon and others, 2002) provides a unique record of postcaldera eruptions, the interplay between volcanism and filling of the lake, and sediment transport within this closed basin. Knowledge of the geology and eruptive history of the Mount Mazama edifice, greatly enhanced by the caldera wall exposures, gives exceptional insight into how large volcanoes of magmatic arcs grow and evolve. Lastly, the many smaller volcanoes of the High Cascades beyond the limits of Mount Mazama are a source of information on the flux of mantle-derived magma through the region. General principles of magmatic and eruptive processes revealed by the present study have been incorporated not only in scientific investigations elsewhere, but in the practical evaluation of hazards (Bacon and others, 1997b) and geothermal resources (Bacon and Nathenson, 1996) in the Crater Lake region. In addition to papers in scientific journals, field trip guides, and the hazard and geothermal reports, the major product of this long-term study of Mount Mazama is the geologic map. The map is unusual because it portrays bedrock (outcrop), surficial, and lake floor geology. Caldera wall geology is depicted in detail on the accompanying geologic panoramas. This digital database was compiled with ArcInfo version 7.2.1 and consists of files containing geologic map and topographic base data in ArcInfo coverage and grid format. ArcInfo-compatible GIS software is therefore required to use the files of this database. The database is stored in a single zipped folder (crater-lake.zip) in this release for ease of transfer. The scale of the source map limits the spatial resolution (scale) of the database to 1:24,000 or smaller. Download crater-lake.zip containing the digital database (12.4 MB compressed; 20.7 MB when expanded). Federal Geographic Data Committee (FGDC) metadata are available for the digital geologic map in text format. FGDC metadata are also available for the topographic base data in text format. View the photograph collection (22 MB total). Below are some links to Crater Lake-related websites. For questions about the content of this map, contact Charlie Bacon. For questions about the database, contact Dave Ramsey.